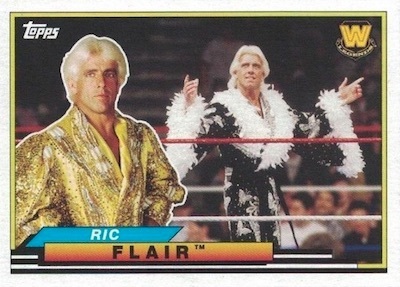 Wrestling cards with a little old-school style, 2018 Topps WWE Heritage features the stars of the ring using the '89 design. Collectors can look forward to two hits per Hobby box, with at least one being an autograph. 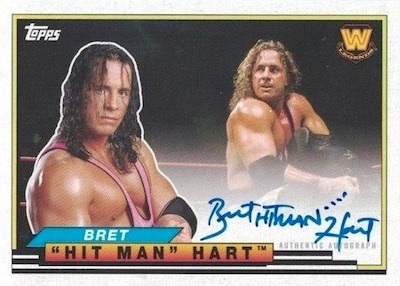 While 2017 WWE Heritage utilized the 1987 design, the 2018 release skips a year, borrowing the 1989 Topps Baseball design instead. Sporting thick borders and a wavy nameplate, the '89-inspired base set features 110 wrestling subjects from WWE and NXT. Bronze parallels are the most common at 1:2 packs, followed by Blue (#/99), Gold (#/10) and Red (1/1). The limited Silver version is numbered to 25 copies and exclusive to the Hobby format. There are also several inserts to collect, including the Big Legends (2 per pack) set containing 50 of the all-time greats. 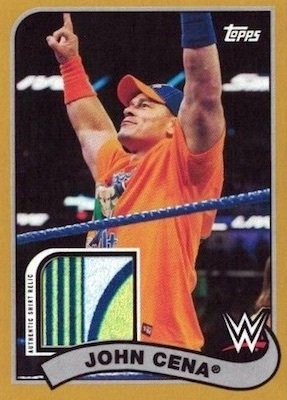 Meanwhile, Top Ten Rookies (1:3 packs) highlights 10 of the rising stars in the WWE. Focusing on 20 dynamic pairings, the Tag Teams & Stables insert averages 1:2 packs. Adding to that are Bronze (#/99), Blue (#/50), Silver (#/25), Gold (#/10) and Red (1/1) parallels for each. 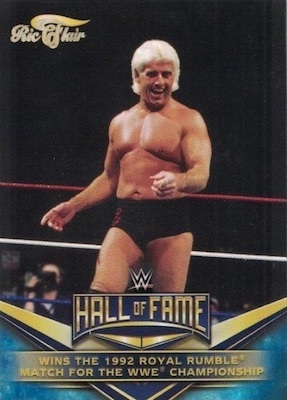 Part three of the Hall of Fame Tribute (1:6 packs) continuation fills in cards #21-30 of the 40-card set centered around Ric Flair. 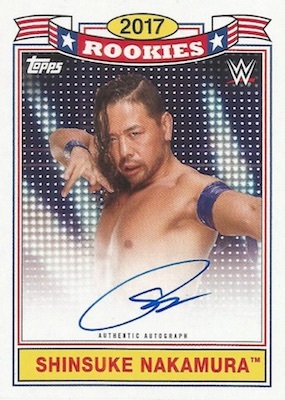 Moving to the real action, every Hobby box has at least one autograph, and the 2018 Topps WWE Heritage checklist works with several different options. The base Autograph line sticks with the main design as well as Blue (#/50), Silver (#/25 - Hobby only), Gold (#/10) and Red (1/1) parallels. There are also Big Legends Autographs and Top Ten Rookies Autographs, each with Silver (#/25 - Hobby only), Gold (#/10) and Red (1/1) parallels. Finally, the Dual Autograph cards, numbered to 10, pair two Superstars. In standard Topps fashion, multiple relics close out the hits. 2018 Topps WWE Heritage Wrestling includes mat relic sets for NXT TakeOver: WarGames 2017, Survivor Series 2017, and TLC: Tables, Ladders & Chairs 2017. All three sets have the full assortment of parallels and an Autograph version, numbered to 10. Collectors can also find Kiss Cards (signed and unsigned), Shirt Relics and Triple Mat Relics. The Commemorative TLC Medallions cards naturally feature tables, ladders and chairs. These have standard parallels numbered to 99 and less, Mat Relic editions limited to 50 and less, and Autograph versions numbered to just 10. 2018 Topps Heritage WWE Irwin R Schyster IRS ON CARD SP Auto 50 WRESTLING! 119 cards. Buy complete base sets on eBay. 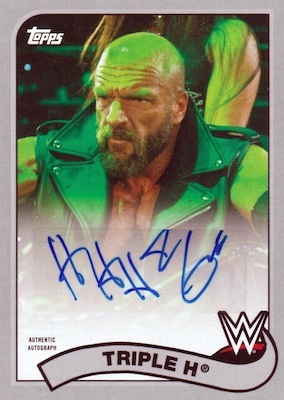 Shop 2018 Heritage WWE autographs on eBay. PARALLEL CARDS: Silver #/25 (Hobby), Gold #/10, Red 1/1. 50 cards. 2 per pack; 4 per Fat Pack. PARALLEL CARDS: Bronze #/99, Blue #/50, Silver #/25, Gold #/10, Red 1/1, Printing Plates 1/1. Continuation set of 40 cards. 10 cards. 1:6 packs; 1:3 Fat Packs. 10 cards. 1:3 packs; 1 per Fat Pack. 20 cards. 1:2 packs; 2 per Fat Pack. Nice looking cards. Where are the roster updates available? I opened a hobby case and saw none. We aren’t sure what format those come in as that wasn’t specified. They’re are exclusive to hanger boxes as I recently seen. 2018 Topps WWE Heritage Wrestling Factory Sealed HOBBY Box-2 HITS-AUTOGRAPH!